How do I know they're on my plants? them, then you can take steps to protect your fruit. Photo: Dept. of Entomology, Univ. of Minnesota. 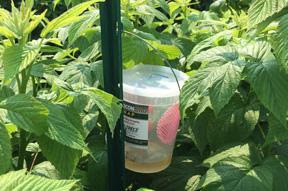 If you are growing susceptible fruit in your gardens, including raspberries, blackberries, blueberries, cherries, strawberries, or grapes, set out traps to determine when SWD is first active in your area. SWD is a very destructive invasive insect pest that can severely damage untreated susceptible fruit crops. The best approach to managing SWD is through detection, sanitation, and insecticide treatments.